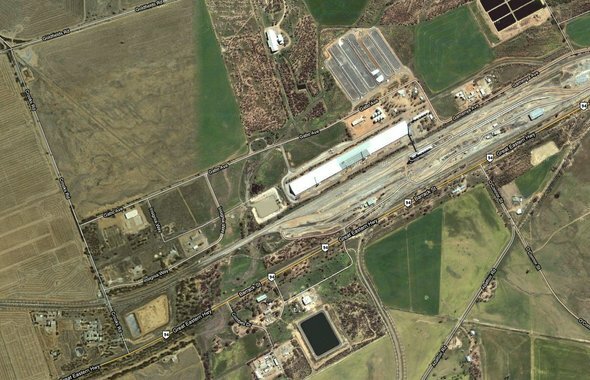 For the the desert town of Merredin, Western Australia we developed a solution that addresses a combination of economical, environmental and physical problems the town was facing. 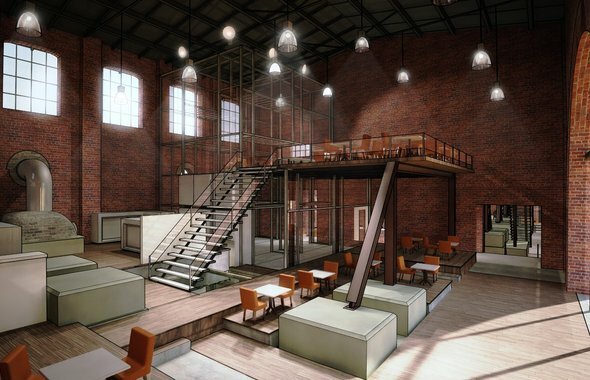 The project centers around a historical pump station from 1903 in need of restoration. Using systems analysis a perfect match solution was found to address social, environmental, and economic issues at once: with a Spirulina algae plant. This unusual solution was found after extensive research into the local conditions and available possibilities. A research document extensively analyzed the physical, social, environmental and economical conditions and the business case. The pump station, restaurant and Spirulina plant result in a bright future for the town, and a beautiful and fully sustainable source of income for its inhabitants. Merredin currently consists of about 5000 inhabitants. The problems of the town vary from a high water ground level to financial problems, economical decline and social stress. A water pumping station dating from 1903 on the border of collapse that needed to be restored offered an entry point for us to investigate the possibilities for a truly sustainable, systems based solution. The existing measures for resolving the town's problems were inadequate. Industries and businesses were leaving the town, leaving it stripped of jobs, resources and motivation. With such a complex network of interrelated issues, we used SiD's systems analysis method to unravel the issues and find holistic and fundamental solutions to the town's problems. And it certainly worked. We mapped the physical paramters of the area, including climate, land use, available resources such as waste and natural sources. The social situation was charted as well, including availability of labour, skillsets, demography, culture and the dreams and desires of the people living in town, incuding the children. 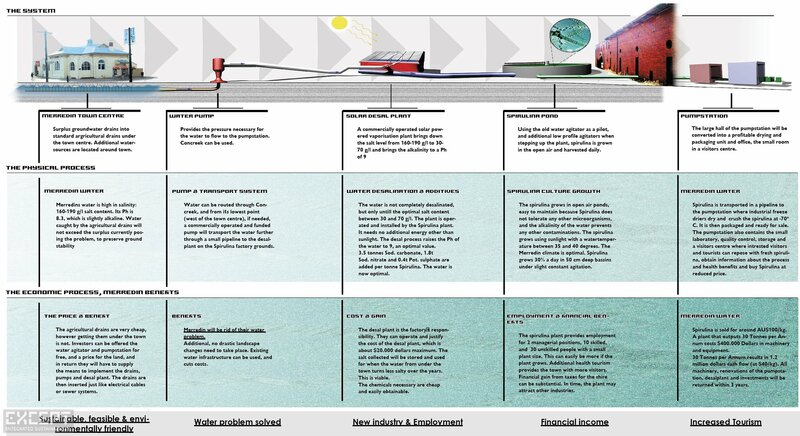 Lastly, the ecological and economical flows were mapped to round off the system analysis. We subsequently sought to connect available but unused resources to the desires and demands of the town. By cross-pollinating these needs and resources, we found a myriad of possible solutions. We then narrowed them down to the most promising ones. One solution, while unusual and unexpected, popped out as a high potency solution to reconnect all these issues in a long-term and economically strong manner. It came out of our research into using ecology as a driver of added value, and the result was the possibility of a specific algae type to grow in the saline ground water of the region. This ecological solution, coupled with the solidity of the health foods industry, fitted perfectly within the existing framework of the town. After considering a plethora of options, the Spirulina Plant has been chosen because of a number of reasons, of which most importantly the suitability to the climate, its ability to solve multiple problems at once and its economical strength. Spirulina has been cultivated very successfully for quite some time now. It’s high price, and the willingness of consumers to pay this price makes it an excellent industry for economically depressed areas. Successful operations have already been conducted in declining South African towns which are now thriving. The manufacturing process requires little additives and is straightforward, and Merredin’s location on the highway between Perth and Sydney is ideal. Spirulina farming is a highly profitable and very ecologically friendly enterprise. Spirulina is used for a myriad of applications, but can be consumed pure as well, which is the main target of the plant, and yields the highest profit. The market for spirulina is growing rapidly and is already substantial. 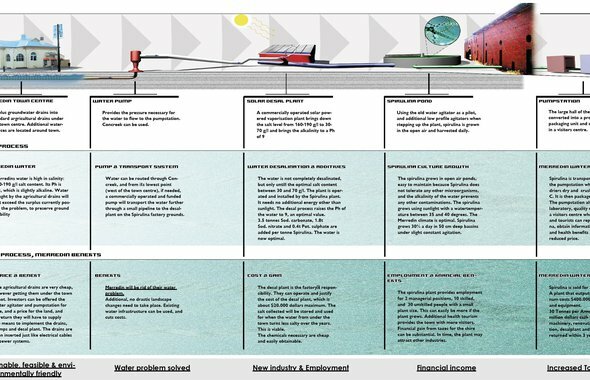 A business case was drawn up, and it quickly showed us that it would be economically feasible, provide plenty of jobs to the town, hook into existing infrastructure and would only use resources which were abundant in town. The plant would be able to return on its investment within 5 years of operation, with a large safety margin for error. 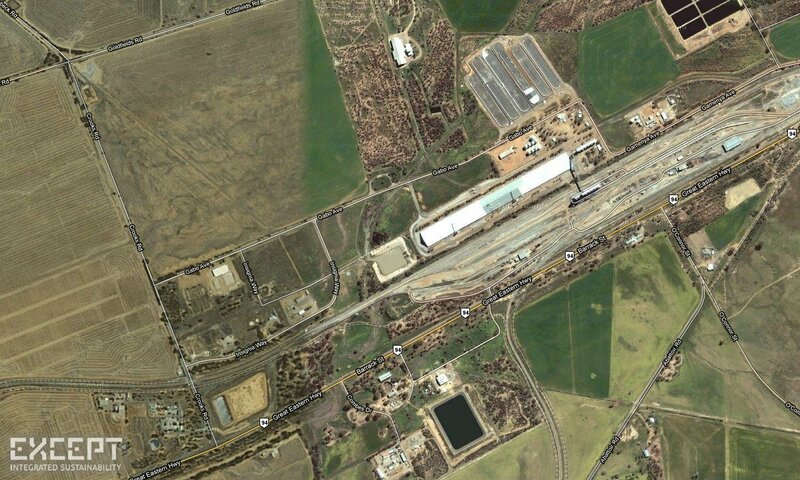 Merredin has a consistent high grounwater level, because it lies in a shallow valley stretching over dozens of miles. The ground water is highly saline and causes problems by cracking foundations of buildings and roads. The water is an abundant resource, and if tapped by a certain volume per year, it will maintain a level where it causes no problems. The excess ground water is caught by agricultural drains that are planted under the town. 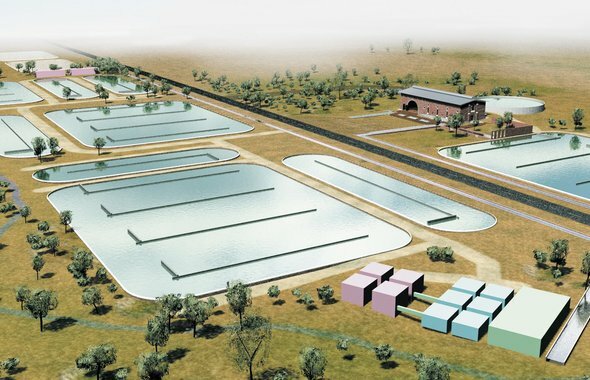 The water is then transported (through an existing dry creek), processed by solar desalinators to drop the salinity by a few percent, and used in the Spirulina plant as an ideal groth medium for the algae. The water is pumped into large, shallow open ponds, that are easy and cheap to fabricate. The algae grow in the water and use mostly sunlight to grow. They grow at an astonishing rate of over 30% a day, making a consistent output of algae a guarantee. The algae are then pumped into the old water pump station, which is converted to a small freeze-drying and packaging plant, with some offices for management, and a small visitor's center with a cafe. The spirulina is then dried, bottled and shipped to Perth. 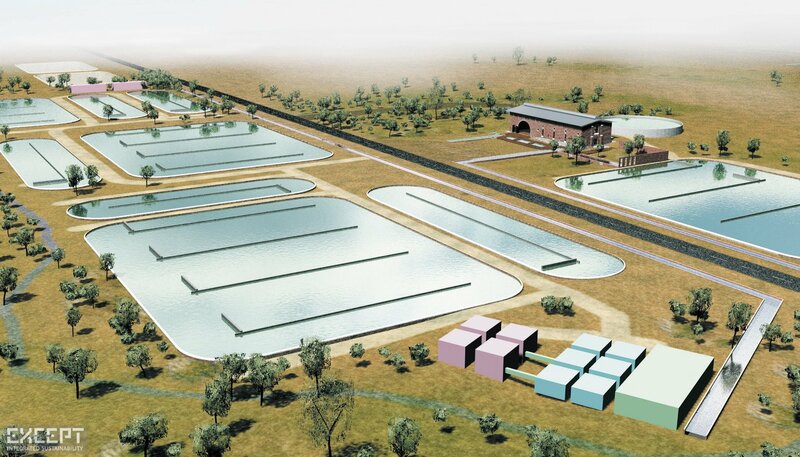 Merredin’s location on the trade route between WA and NSW is optimal for transportation of the Spirulina goods. The factory as calculated has an amazing return on investment of within 5 years, with a 300% safety tolerance. The factory provides employment and functions as a tourist attraction. Furthermore it eliminates the water problem of Merredin and aid the shire in its economic development, and give it economical and ecological status nationwide. By preventing the water to reach problematic heights and a removal of excess water the town is rid of the water problem. This will also prevent the salt to surface and the destructive effects thereof. The plant will provide employment and gather health-tourism. It provides a stable base for future growth of the town and an influential economic factor. It provides employment for future generations and serves as foothold for marketing Merredin as a health-region (further fortified by the wheat industry). The tourism will provide more work in the rest of town, and infuse money into Merredin. The pump station will have found a stable and fruitful role in Merredin, turning a problem into an advantage. The shire will reap substantial economical benefits from a successful industry. The shire can initiate this project, and gain an interest in the plants finances and operation, to further the benefits for the Shire. Our research point to a very successful enterprise, with an unsurpassed return on investment, and growth potential. Return on investment: Within 5 years. The Landscape design was driven largely by the functions the plant needs to perform, but one of the more important features of the design is that it offers an incredible view upon arrival in Merredin. The big agitator tanks reflect the sky and stretch far into the distance as viewed from the road. This increases the recognizabillty of the town, and attracts more tourism. This is also the reason why there is no wall around the complex to obstruct views. Instead, a small moat keeps unwanted curiosity out, and functions as a main supplier of water to the tanks. The placement of the tanks is optimized to minimize grading of land. Pump station number 4 from 1903 has originally been designed and built by C.Y. O’Connor. It’s a testament to the quality and dedication put forth by the early pioneers of the Western Australian desert. Restoration plans of WaterCorp allow for the change of function required for this plan. The design minimizes invasion of the Pump station, preserving all the characteristic elements and using pragmatic solutions without harming the building. The pump station creates three spaces in its envelope. The first space is a large hall measuring 22 by 14 meters, three stories high. A wooden floor surrounds big old granite plinths that used to support the big pumps. These 6 big plinths divide the space but also provide a base for constructional elements. 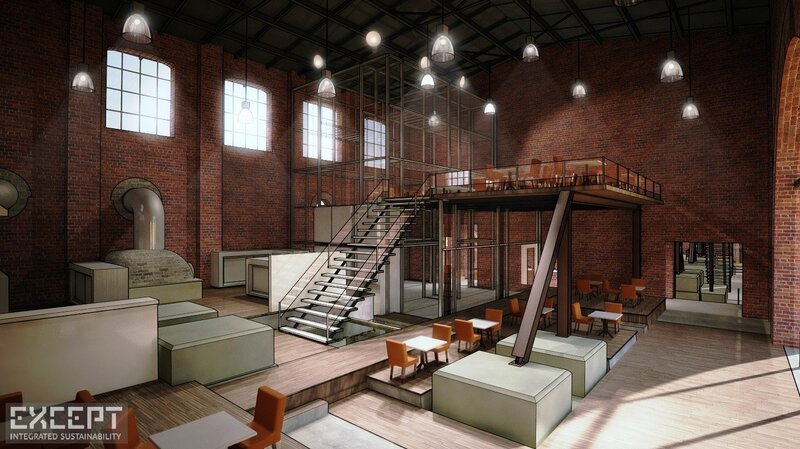 This space will incorporate the new factories’ machinery and the administrative section. The two other spaces are just as high, but smaller. The middle one is an awkwardly narrow corridor not more than 2 meters wide and 14 meters long. This area will contain some of the bathrooms for the factory and café. The cafe resides in the third space on the east side of the building. This space has a huge arc on the north side through which trains used to ride into the building to deliver coals and wood for the pumps, and is turned into a large picture window. The Merredin Spirulina plant has been a shining example for us that provies that systems analysis, holistic design and the merger of disciplines as diverse as economics, ecology and design can yield breakthough solutions for even the most remote and unexpected situations. We see a bright future for ecology driven economies, systems design and the inclusion of social aspects within development processes. By documenting this project extensively, we hope you've been able to travel with us on this remarkable experience.